Many of the world's capital cities have local ferry services, providing an indispensable and affordable link for its residents. 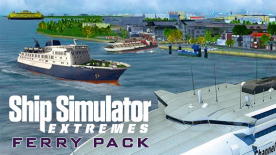 The Ferry Pack brings 5 new ferries, a brand new player campaign with 10 missions and new ferry specific gameplay features to Ship Simulator Extremes, adding many hours of gameplay for all virtual captains! 5 new Ferry types (Fast, Channel, River, etc.) available in Campaign, Free Roam and Multiplayer mode. Ferry specific gameplay: Ferry ramp & door opening for loading/unloading, Directional switch for two-ender ferries, etc.